1. What is the content of Sacred Tradition? This seems kind of important since Sacred Tradition is considered revelation. How can one appeal to Revelation if the content of said revelation is ethereal? How does one know if actions and teachings are in accord with said revelation when no one but the teacher has access to it? The concept of Sacred Tradition comes disturbingly close to Gnosis. 2. What is the infallible list of mortal sins? The Roman Catholic Church will tell you the definition of a mortal sin but it doesn’t infallibly state that any given action meets the definition. Again, this seems kind of important since a mortal sin places one’s soul in danger. 3. What is the infallible list of infallible teachings of the Roman Catholic Church? There are after all many teachings that a Roman Catholic must believe to be considered a faithful Roman Catholic on pain of anathema. We know some of these teachings – Papal infallibility, the Marian dogmas, Extra Ecclesiam Nulla Salus Version 2.0. But what is the complete actual list? That spectre of anathema establishes the necessity of the need to know. It’s this final unanswered question on which must presently focus. Regarding this last question, one of the stock answers I typically receive is: “The Catechism of the Roman Catholic Church.” But of course the Catechism is not an infallible document, so that answer does not even clear the first hurdle. And look here, Pope Francis has confirmed it once again. He has changed the Catechism to assert that the death penalty is now “inadmissible because it is an attack on the inviolability and dignity of the person”. But don’t worry. He may have overturned 2,000 years of Christian teaching in a single pen stroke, but we are assured that this new teaching is “an authentic development of doctrine that is not in contradiction with the prior teachings of the Magisterium”. Nope. Not at all. Not even a little bit. Don’t even go there. The reader will find a slurry of rationalisations to justify the claim that there is no contradiction – all of which amount to: “That was then and this is now.” My personal favorite would be that the death penalty “had developed in an environment in which it was more difficult to guarantee that the criminal could not repeat his crime”. One notes that it was also more difficult in that environment to establish that the criminal had in fact committed the crime in the first place. One would think the Rome of yesterday would have considered it important to be more circumspect of the death penalty given that context. But, of course, we are ever so much more enlightened now. Today “there is an increasing awareness that the dignity of the person is not lost even after the commission of very serious crimes”. Ancient people, being primitive brutal savages, didn’t realise that truth: they had (to use the common metaphor) only acorns to guide them. But today we have oak trees. And the European Court of Human Rights. Doctrine is all grown up now. It remains to be seen how the Roman Catholic world will take to this ‘development’ of doctrine. My informal anecdotal survey of one would seem to suggest ‘not well’. I asked my Catholic friend (let’s call him Jeff) if he was willing to submit to this new teaching, and he replied with an emphatic negative. Because he is a serious Catholic, Jeff is constantly put in compromising positions by Pope Francis – especially since I can’t resist pointing out to him the Pope’s latest excursions into heterodoxy. But this death penalty (ahem) development places Jeff in an especially difficult position. He is now crosswise with his own Catechism and its prominently displayed Nihil Obstat. He can no longer cite it as an authority. As soon as he tries to do so, I am going to point right at this section of the Catechism and ask him why he rejects the very authority he cites. 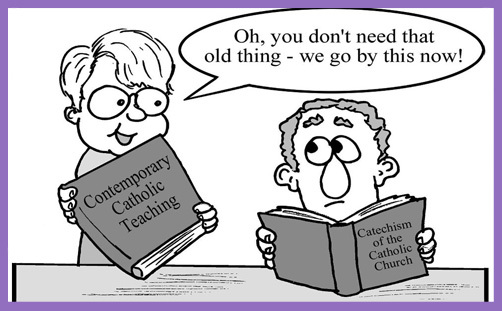 If he tries to use an older catechism, I will point out the conflicting Nihil Obstats. Pope Francis has demolished backwards compatibility across versions of catechisms. What was once considered truth is now considered error by Papal declaration. Massive amounts of arm-waving about ‘development’ cannot disguise the fact that ‘X’ has become ‘not X’ and both have been declared to be without error by the authority of the Roman Catholic Church. Pope Francis has now positioned his church for a fight over dueling catechisms. Serious Catholics understand this. The conflict between Protestant and Catholic has always been a conflict over authority. The Protestant presumes about Scripture that which the Catholic presumes about the Magisterium. As Pope Francis continues with his task of refashioning the Roman Catholic Church into the image of Episcopalian Enlightenment, he cannot help but undermine the authority of the Magisterium along the way. He has no choice. He is seeking to overturn teachings that rest solely on Magisterial authority. If the teachings were wrong, then the Magisterium taught error and Magisterial authority is compromised. He may say that he is ‘developing’ doctrine instead of contradicting settled teaching, but changing the label of a thing doesn’t change the nature of the thing. People will see and realise and draw the appropriate conclusions. Francis is puncturing the pretensions of Roman primacy. And things will get serious when the subject turns to the Idol of the Age – because that is where this is leading. To change the Roman Catholic Church Francis must change its teaching on sexuality. The immediate issue is just the death penalty. A change on the death penalty is just contradicting Scripture as far as Rome is concerned. A change on sexuality would threaten a settled infallible teaching of the Magisterium. There will no longer be any ability to say: “This is not about infallible teaching.” When Francis (or his successor, elected as he will be by all those cardinals Francis is appointing) says that condemnation of homosexual behavior is “inadmissible because it is an attack on the inviolability and dignity of the person” then there will no longer be any place to hide. Surely it will be said that this change is “an authentic development of doctrine that is not in contradiction with the prior teachings of the Magisterium”, but not even the author will credit that bit of subterfuge with any substance. It will simply be a palliative offered to salve the wound inflicted upon Roman authority by those who seek to modernise the teachings of the church. Meanwhile, the secular world is watching. Pope Francis’s condemnation of capital punishment is simple and unambiguous: it is inadmissible. No exceptions for especially heinous crimes; no loopholes allowing execution when other lives might be in jeopardy, as in past Roman Catholic teachings. The church’s new position on the death penalty carries no formal punishment for defying it, but in eliminating any ambiguity it does compel Catholic officials at least to find concrete reasons to not abide by it. That’s pretty mild, all things considered. No staunch declarations of inviolable sovereignty may be found. Do you think the NY Times would take such a neutral position about the issue of abortion? The Catholic politician who finds himself in conflict over abortion is expected to stand firm. The Catholic politician who finds himself in conflict over capital punishment is expected to justify himself before his own church. This editorial is a reward to the ‘new and improved’ Magisterium for getting on side. Rome is getting good press for once, and from the cultural elite of the West. Imagine the good press it will receive when it walks back all those prohibitions on human sexual conduct. And then ask yourself the obvious follow-on: what spirit is really guiding the Magisterium in its decisions these days? Rome is a hierarchical church, and such a church is vulnerable to capture from above. The Roman Catholic will no doubt appeal to his or her belief in the divine construction of that hierarchy and its implicit guarantee of divine protection. Those of us who see that claim as so much smoke will wonder after the future of this church and see schism. Modern religion has got its claws into the Vatican – how will they be removed?